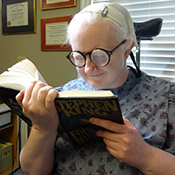 How does Albinism effect vision? 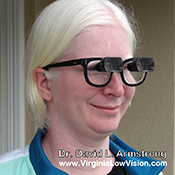 Albinos often have high amounts of farsightedness, nearsightedness or astigmatism. The vision is not well corrected with eyeglasses or contact lenses. They have varying degrees of impaired vision. It is also common for albinos to have nystagmus, a constant, involuntary movement of the eyes. How can Albinos be helped to see better? 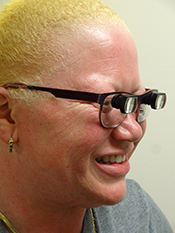 Telescopic or microscopic glasses can be very helpful to albinos. By magnifying the image of what the person is looking at it can be seen better. 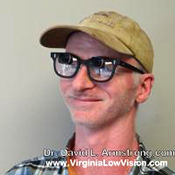 Dr. Armstrong prescribes many different types of telescopic and microscopic glasses. By careful evaluation of the remaining vision he can determine what will best suit the person's needs. 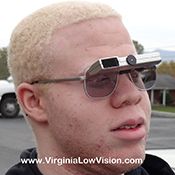 Can people with reduced vision from Albinism qualify to drive? The majority of states, including Virginia, allow people with vision loss to drive while using bioptic telescopic glasses. Some of Dr. Armstrong's Albino patients, pictured below, are licensed and drive safely and legally with their bioptics. "It's amazing to be able to sit in my truck at the top of the hill at my friend's house. I look down at the dock floating and can actually see it moving. Thank you doctor." "I've never been able to see my own face in a mirror. All the other eye doctors told me there was no hope. I thought I would be this way the rest of my life. There's finally a rainbow in this sea of clouds." "The glasses are wonderful. I'm not even self-conscious when I go out with them because I can see so much better than before. Thank you Dr. Armstrong for what you've done for me." "I want to thank you so much for helping me get the bioptics. For 3 years I've been waiting to find out if I was ever going to drive and now you have made it possible for me. I can't explain how much this means to me." "Dr. Armstrong, I want to thank you. I am so grateful for the way you have allowed God to use you to be a blessing to others, like myself. I'm so excited about this journey back to freedom and independence."